two to 10 by 2020, building construction around the world is literally reaching new heights. Earning the number one spot on the list is the 128-storey Shanghai Tower in China. At 632 metres high, the tower is already the tallest building in Asia and the 3rd tallest globally. When it officially opens in 2015 it will house office space as well as one of the world’s highest hotels. Earning the runner-up spot on the list is the 88-storey Wuhan Centre in Wuhan, China. At 438 metres high, the tower will be the 19th tallest in the world and will be specially designed to reduce wind resistance and the vortex action that builds up around skyscrapers. However with other tall buildings already being planned for Wuhan it will not top the list for long. Climbing to the top three is the Marina 101 tower in Dubai, the 21st tallest building globally. At 426 metres high, construction began in early 2006 but was stalled due to the global financial crisis. The 101-storey skyscraper will finally be completed in early 2015. Known for the world's tallest skyscraper Burj Khalifa, Dubai isn't afraid to go high with the Marina being the second tallest tower in UAE. In New York City, 432 Park Avenue has already been completed and the 85-floor apartment tower is the tallest building in the western hemisphere. It takes the cake as the 22nd tallest building globally. The building holds Park Avenue’s most expensive unit on the market a full-floor, 766 square metre Penthouse going for a whopping $82.5 million dollars (approx. AU$100 million). Making the halfway mark is the 79-floor Capital Market Authority Tower in Riyadh, Saudi Arabia. At 385 metres high, the tower will be the 34th tallest globally and will boast external layers of fins, gantries and perforated panels to shade the building from the desert sun. The skyscraper will be the second tallest building in Saudi Arabia when completed behind the 601-metre Makkah Clock Royal Tower in the holy city of Mecca. At 80-storeys high, the Eton Place Dalian Tower In China will be the 37th tallest building globally. The 383-metre tower is one of five skyscrapers in the Eton Place Dalian development, which also includes a 62-storey building and four 42-storey towers. When completed the building will have space for apartments, offices, retail space and entertainment facilities. The 95-storey Vostok Tower is part of Moscow’s fast-growing business district. Once the building is topped off, it will be the tallest in Europe. Globally this tower ranks in at 43rd tallest upon completion. Russia earns another spot in the top ten. Moscow’s thriving International Business Centre will use this 85-storey beauty to add to the Russian metropolis. Upon completion, this tower will be the 55th tallest building globally at 352 metres high. The building will hold residential and commercial space. At 68-floors high, the multi-complex towers will boast a mall, hotel, office space, residential units and a subway. 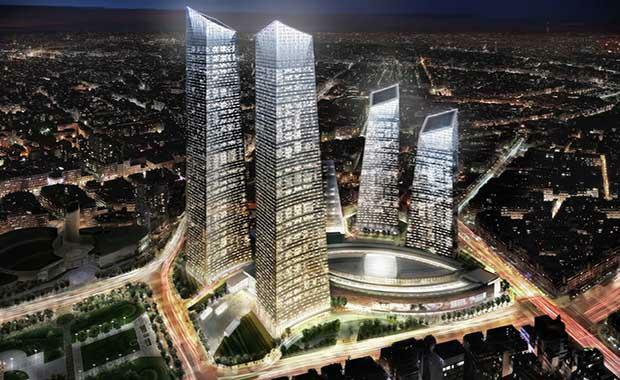 Tower 1 will be the tallest building in Shenyang at 384 metres when completed. The buildings are developed by Hang Lung Properties. The 76-storey new headquarters for the Abu Dhabi National Oil Company, at 342 metres high, will be the 62nd tallest building globally upon completion. The list is based on data from the Council on Tall Buildings and Urban Habitat, the recognised authority on skyscraper height.